On October 17, 2018, 450 San Jose State students filled Morris Dailey auditorium to watch a special performance of “No Belles,” a play that explores gender bias in science and underscores how few women have been awarded the Nobel Prize. The event was organized by Chemistry Lecturer and Chair of the American Chemical Society of Silicon Valley Melody Esfandiari, who worked hard to ensure that the performance was free for SJSU students. The show highlighted the sacrifices made by woman scientists and reinforced Esfandiari’s commitment to serving aspiring scientists. She has been named the 2019 Outstanding Lecturer in recognition of her dedication to teaching. 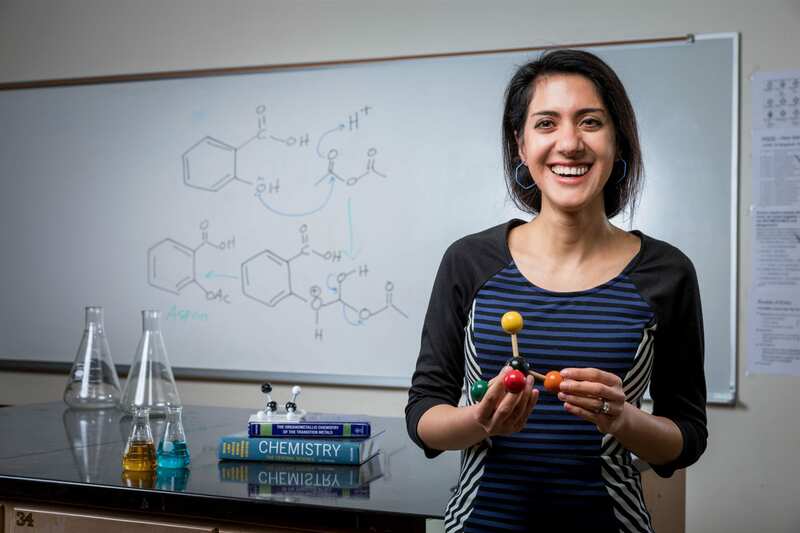 As a college student, Esfandiari wasn’t sure what to study until she took a class with Chemistry Professor Karen Singmaster, who encouraged her to pursue science. Singmaster invited her to teach chemistry workshops to fellow undergraduates, and by her senior year, the future chemist was teaching her own lab. As a PhD student at UC Irvine, she refined her teaching skills with the guidance of chemistry professor Suzanne Blum. Since returning to SJSU in 2012, Esfandiari has taught more than 3,500 students, coordinated the introductory chemistry courses (which has more than 700 students annually), overseen 30 teaching labs a year, managed 10 laboratory teaching assistants, run a summer internship program for underrepresented students, and helped organize the 2017 undergraduate research symposium, which attracted students from 13 schools in Northern California to present their research projects. She shows no sign of slowing down. The Outstanding Lecturer Award recognizes a lecturer for excellence in teaching effectiveness and service to the San Jose State campus community. This year’s winner comes from the College of Science. She will be honored at the 20th Annual Faculty Service Recognition and Awards Luncheon on March 21, 2019. Tickets are available for purchase.